MEDFORD, Ore. — Oregon's famous wandering gray wolf, dubbed OR-7, may have found the mate he has trekked thousands of miles looking for, wildlife authorities said Monday. It's likely the pair spawned pups, and if confirmed, the rare predators would be the first breeding pair of wolves in the Oregon's Cascade Range since the early 1900s. 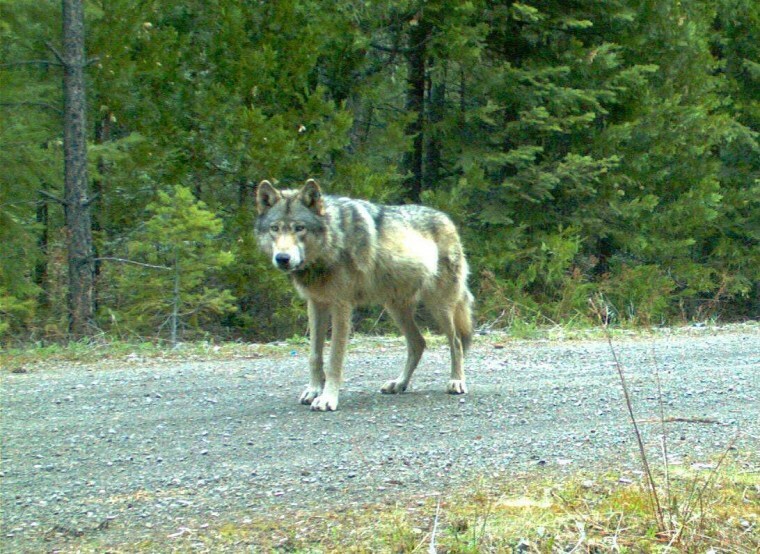 Officials said cameras in the Rogue River-Siskiyou National Forest in the southern Cascades captured several images of what appears to be a female wolf in the same area where OR-7's GPS collar shows he has been living. U.S. Fish and Wildlife Service biologist John Stephenson said it is not proof, but it is likely the two wolves mated over the winter and are rearing pups that would have been born in April. Biologists won't start looking for a den until June, to avoid endangering the pups. "It's amazing that he appears to have found a mate," Stephenson said. "I didn't think it would happen. It makes me more impressed with the ability of wolves to survive and find one another." Young wolves typically leave their pack and strike out for a new territory, hoping to find a mate and start a new pack. OR-7 has been looking for a mate since leaving the Imnaha pack in northeastern Oregon in September 2011. His travels have taken him thousands of miles as he crossed highways, deserts and ranches in Oregon, moved down the spine of the Cascade Range deep into Northern California and then back to Oregon, all without getting shot, having an accident or starving. Federal Endangered Species Act protections for wolves have been lifted in eastern Oregon, where the bulk of them reside, but they remain in force in the Cascades. Protections for the animals have also ended in the last several years in the Northern Rockies and western Great Lakes. The U.S. Fish and Wildlife Service has proposed ending the listing across most of the rest of the country as populations have rebounded. A final decision is expected later this year. If a wolf was going to start a pack in a new part of Oregon, ranchers should be glad it is OR-7, who has no history of preying on livestock, said Bill Hoyt, past president of the Oregon Cattlemen's Association. The group supports Oregon's wolf recovery plan and is looking forward to the day the predator's numbers and range expand enough for their protections to be removed. Steve Pedery, conservation director of Oregon Wild, said the news was "spectacular." The conservation group won a court ruling barring the state from killing two members of OR-7's home pack for preying on livestock and later won a settlement strictly limiting when wolves can be killed. "It goes to show that when we act on America's best impulses for the environment, amazing things can happen. We can bring endangered species back," he said. Stephenson expected the battery on OR-7's GPS collar to die soon, so the biologist set up trail cameras based on the wolf's most recent whereabouts. The GPS locations also showed OR-7 was staying within a smaller area, common behavior when wolves have pups to feed. When he checked the cameras last week, Stephenson said one had recorded a black wolf he had not seen before. An hour later, OR-7 was photographed on the same camera. The black wolf was confirmed to be female because she squatted to urinate. Officials had planned to let OR-7's collar die, but now that he appears to have found a mate, he will be fitted with a new one this summer to monitor the pack. Stephenson said officials had no idea where the female came from.